A contaminant-free lab is critical. However, even under the best of conditions, contaminants can be inadvertently left behind. It doesn’t matter if you use disposable bags or reusable containers. Harmful contaminates can remain on metal stands and reprocessed bins, pails and cans. What is our real solution to this real problem? 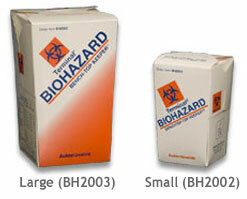 The Whitney Medical Solutions’ Biohazard Bench-Top Keeper! The plastic-lined Biohazard Bench-Top Keeper easily stores contaminated waste items like petri dishes, pipets, test tubes, applicator sticks, swabs and other non-sharp items. Less expensive than rigid sharps containers, the Biohazard Bench-Top Keeper saves you money and keeps your workstation neat and clean. Plus, you can get rid of biohazardous waste right at your workstation without making inconvenient and time-consuming trips to your central biohazard waste container. 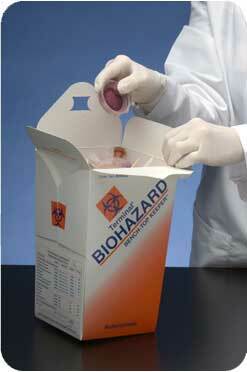 Our containers are made of sturdy paperboard printed with orange biohazard symbols. They are plastic-lined to hold a moderate amount of liquid. Self-locking tops keep contents safely enclosed. The keepers store flat – requiring far less space than rigid plastic containers, and use interlocking flaps to easily fold into shape. Autoclave contaminated materials inside the container and dispose of containers according to local, state or federal regulations.